​Have you ever made big, impossible requests of God? Recently, I set up a fundraiser called Lost Girls: Silent and Suffering with the aim to raise ten thousand dollars. The money would be sent to rescue women and children from the atrocities of war and devastating humanitarian situation in South Sudan. I asked God for His help. The money flowed in quickly. In less than a week, we met our goal. Then followed the monumental task of ensuring the money got to those for whom it was intended. Corruption is rife in South Sudan. Carrying cash is risky. Protect the person traveling to South Sudan who will purchase the plane tickets in the worn-torn capital, Juba. Put a hedge of protection around him. Provide an army of angels to keep him safe. Provide safe passage to the airport for the two women and ten children, who are so vulnerable when out on the streets. Allow them to get to refugee camps in either Uganda or Kenya. God answered my very big requests. Two weeks later, twenty-one people boarded planes to Uganda and Kenya. The husband and father whose job it had been to go to South Sudan and make it happen had returned home safely to his family in America. God had answered abundantly, above and beyond my requests. In scripture, ten lepers had big appeals, too. They called out for Jesus to have mercy on them. They didn’t ask for healing, just mercy. Jesus instructed them to go and see the priest. On the way, their ravaged skin became clean and clear. The disease disappeared. Yet, only one of the lepers turned back to thank Jesus. This man was a Samaritan—an outsider. He should have been the last one to acknowledge Jesus had authority from God to heal. Instead, he was not only the first; he was the only one. The Samaritan leper should have been the furthest from expressing gratitude to Jesus. Yet, he openly and loudly gave recognition to God. The outsider humbly worshipped Jesus. He gave God all the glory. He couldn’t thank the Lord enough. The other nine lepers were nowhere to be seen. I’m sure they were grateful, but where was their gratitude to the One who had answered their requests over and above their dreams? Sometimes, even though we know all good things come from God, we are not as vocal as we should be in thanking Him. We often express amazement at the opportune moment, delight with favorable circumstances or people who helped, or just plain relief when our difficulties are over. Yet, gratitude to God should be first. We should give full credit to God. We might be grateful in our hearts, and in our quiet times with God, but we don’t praise him in front of other people, because—well—we don’t want to seem weird. It’s not too late to turn around in our thinking. We should fall on our faces in humble acknowledgement of God’s goodness towards us. We cannot thank Him too much. I was overjoyed when the money flowed in for our fundraiser. I was relieved all those involved were safe. I was amazed we had rescued more people than I had hoped—some elderly, others sick, teenagers, children and mothers. I felt I should thank the donors. Yet, deep in my heart, I knew this was God’s work. I needed to give Him the full glory. I want to shout my God praise and thanksgiving to Him first. 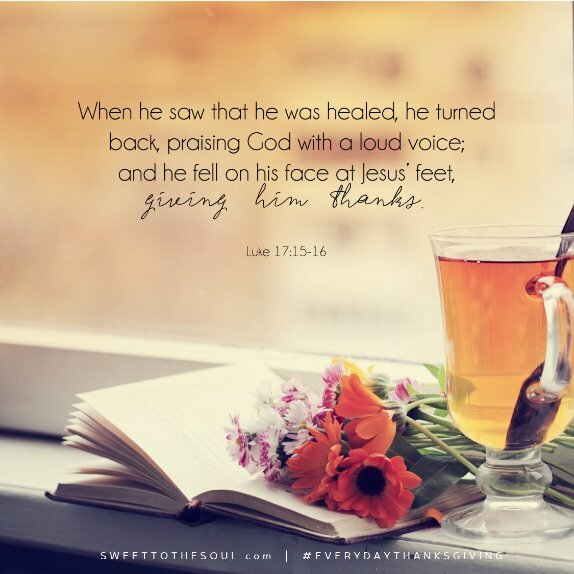 We need to go back and give thanks just as fervently as the Samaritan leper—on our faces. God stirred the hearts of the donors. God provided the money, God allowed the passage safe to Uganda and Kenya. God provided the plane tickets. God made everything possible. My thanksgiving should be equal to my imploring. 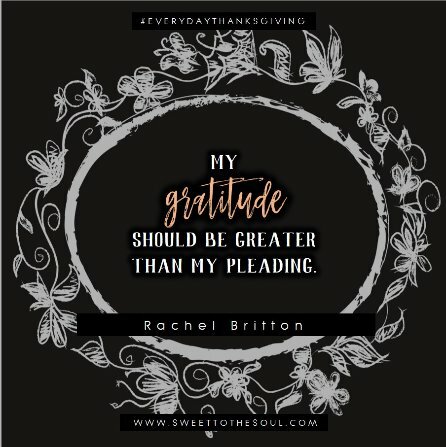 No—my gratitude should be greater than my pleading. Is your thanksgiving larger than the prayers God has answered? Heavenly Father, forgive me if I have been like the nine lepers who failed to give you the proper praise. When You answer my prayers I need to stop, turn around and worship You. Create in me an attitude of thanksgiving, praise, and worship first for what you have done. You are the One who makes all good things possible. I praise your holy name. Amen. 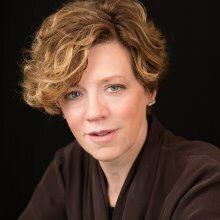 ​Rachel Britton is an author, blogger and speaker. Raised on the east coast of England, Rachel now lives in Massachusetts with her husband and three college-age children. I just wanted to THANK & PRAISE the LORD for this post... I don't know how I found this post... It was a TOTAL God-thing.I'm a recovering addict with almost 4 years clean... I have been fighting to regain custody of my youngest son for over a year, and my anxiety was through the roof. My son's dad is abusive toward him. Name calling, threatening physical violence, that he wasn't "good" enough, that he was ungrateful, The list can go on and on... I was losing myself in the angst of secret phone and Skype calls, listening to my son BEG me to rescue him... But the WORST part was that I was also losing my relationship with God. I was mentally, physically, emotionally and spiritually tired and empty. I lacked in my prayer life, reading & meditating on God's Word and just being with the Spirit. Two days after Christmas (which is my birthday), I received the call I had been fighting for and waiting to hear... My ex-husband signed the papers, and my son was finally safe at home with me. I "thanked" God, kind of like you "thank" a distant relative you hardly know, in that awkward way when they get you something you wanted, but didn't know where the "boundries" are because they're pretty much strangers... I thanked God because I know I "had" to, but there was no emotion, no LIFE behind it... So, I found this post... In the ONLY way God can provide... And I realized what I had... wait, what I HADN'T done. And by the grace of God, through your talent, it struck a chord in my heart, and I want to THANK YOU for this lesson... It was, and IS, literally, "Soul Deep Scripture". God Bless you!